Spent quite a few days following these beautiful butterflies, usually having them give me the slip, when I thought I was about to be in good position. I did not give up, as I was in Israel, the home of do not give up. 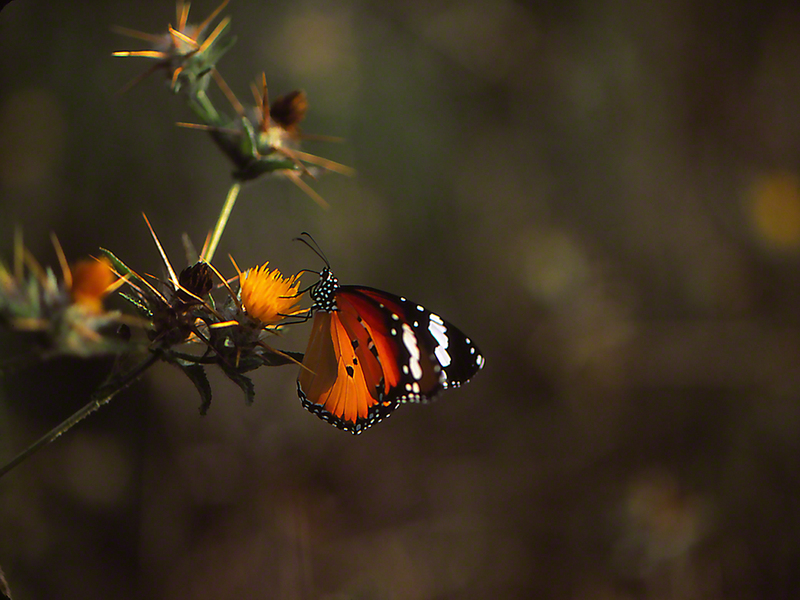 Success was the reward for this persistence, and I’ve loaded several images of these Israeli Danaus butterflies. Fresh or worn, their coloration is striking, and I’m a big fan. Where? The orchards within walking distance from my children’s home in Mishmarot. An irrigation ditch running through abounds with botany, including a healthy stand of Typha (cattail). When? Early morning. July 2014 chased me home each day, at 11 A.M.. No way I can work in the full sun of Israel. Of course on the walk home, I passed construction workers building, oblivious to the scorching sun. Impressive. 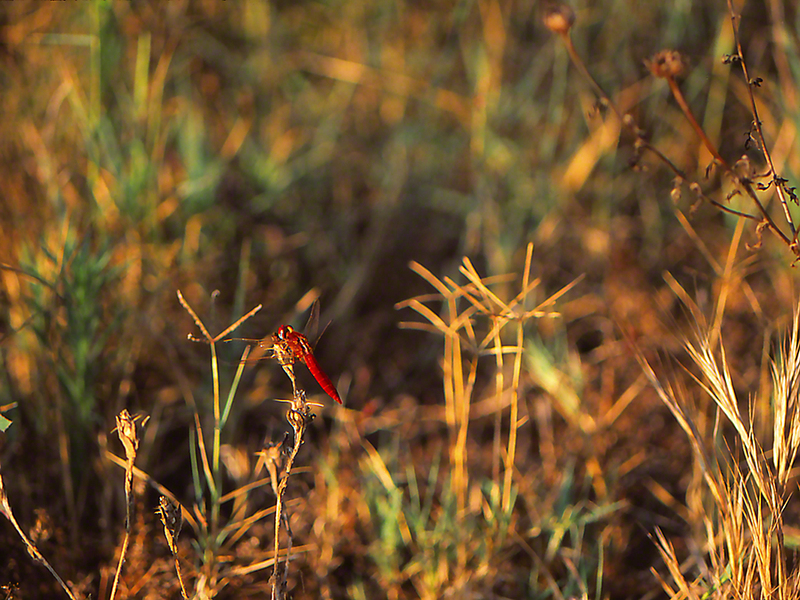 Here we have a male, so focused on quickly retrieving nectar that he forgot that he didn’t want me to approach him. How do we ID him as male? That lowermost black spot on his right hindwing, with its white center, is only present on males. Remember, our USA Monarch males possess small, black glandular structures at just about the same place on their hindwings. A treat for the eyes? No? She is on the plain side, or so you think, until you catch sight of her lush wash of orange, yellow and black and white eyespots. On Israel’s Mt. 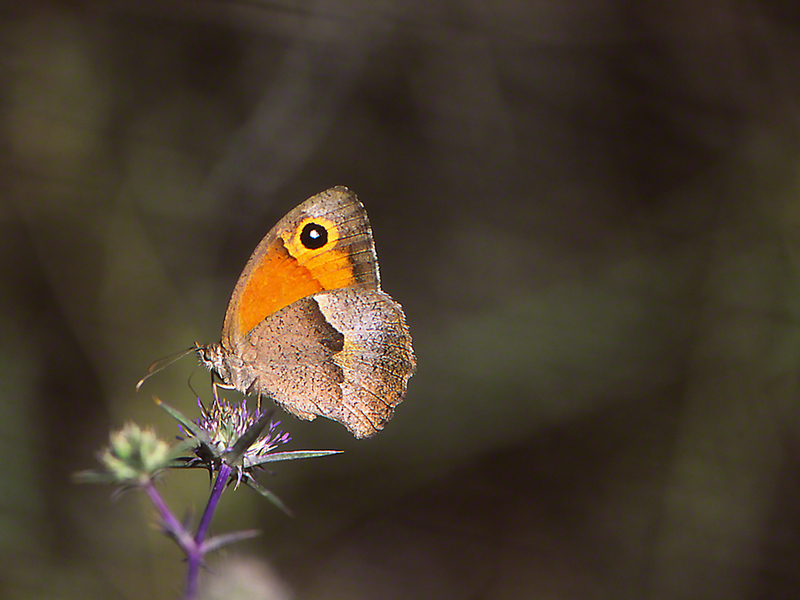 Meron, on that mountain looking out upon the Israeli-Lebanon border, I wanted to find a fresh Maniola telmessia, the Turkish Brown Butterfly. Not my first introduction to them, but most I’ve seen over these last years had subdued color. Drab, I guess. I wanted to come back to the U.S. with images of richly colored females. Here she is, nectaring on wildflowers. I am not sure of the name of these blooms, but I do want you to notice the serious points radiating out from the flowerhead. Many, many wildflowers in Israel are so armored, and you have to be careful, to avoid painful brushes with these mini-spears, that can hurt. So yes, we, I, do have our favorites, and we do, that is I do, forever want to get that better image, better than the one I already own. Like photographers who work sports venues, I suppose. I was visiting my daughter Rachel in Mishmarot, Israel. The kibbutz’s orchards were just a 3 minute walk from Rachel’s home. The sun in Israel rises like it does in Arizona, early. Those July 2014 mornings, after Rachel gave birth to Boaz, I did it. I got up at 4:30 A.M. those mornings, had my breakfast/coffee, and went to the fields that surrounded the orchards. 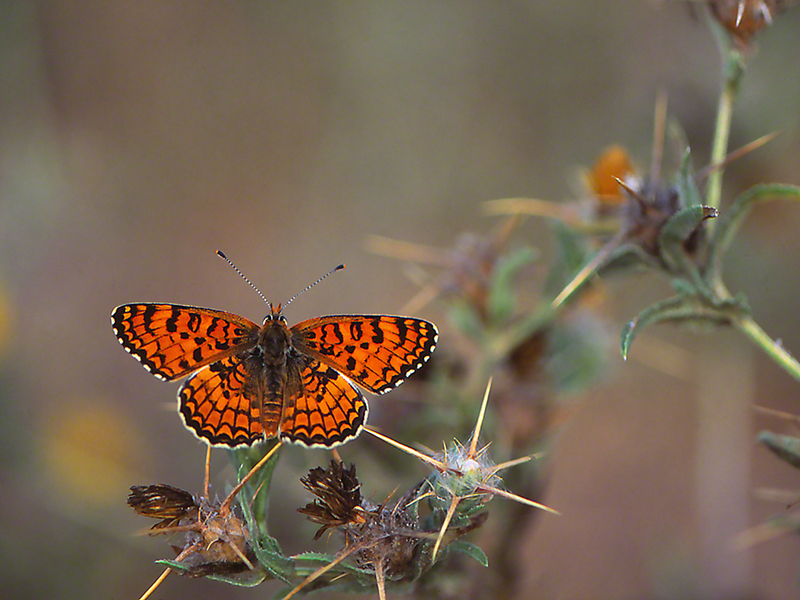 I usually was there by 6:30 A.M..
Butterflies in arid regions begin their day as early as they can, so that they can warm in the pleasant morning sun, and can get first dibs at the nectar that the flowers begin to pump. This female fritillary was as you see her, when I reached that good, good stretch of field. Look at her, richly patterned in burnt orange, black and white trim. Cautious approach, her acceptance that she was at no risk. Good. Very good. What fine work! Morning after morning I reached the fields abutting the orchards of Mishmarot, Israel. It gets very hot there in early July, and the nectar from these Centaurea hyalolepis blooms must be especially tasty early, before the heat arrives. The wildflowers along the orchard margins, and in the agricultural ditch nearby, brought lots of butterflies. Good. This comely female Danaus chrysippus was typical of almost all of the Plain tigers that I saw those 7 mornings. More difficult to approach than their closely related Monarchs in the U.S., it was almost always approach slowly . . . and watch the Plain tiger fly off to a another flowerhead, 20 feet away. Sweatband across my forehead threatening to be overrun with sweat, time and again I would regroup and decide whether to follow the one that flew, or find a new one. Comparisons came to mind. North American Monarchs rarely are birdstruck (have bits of their wing margins missing). Israeli Plain tigers also are usually complete in wing. 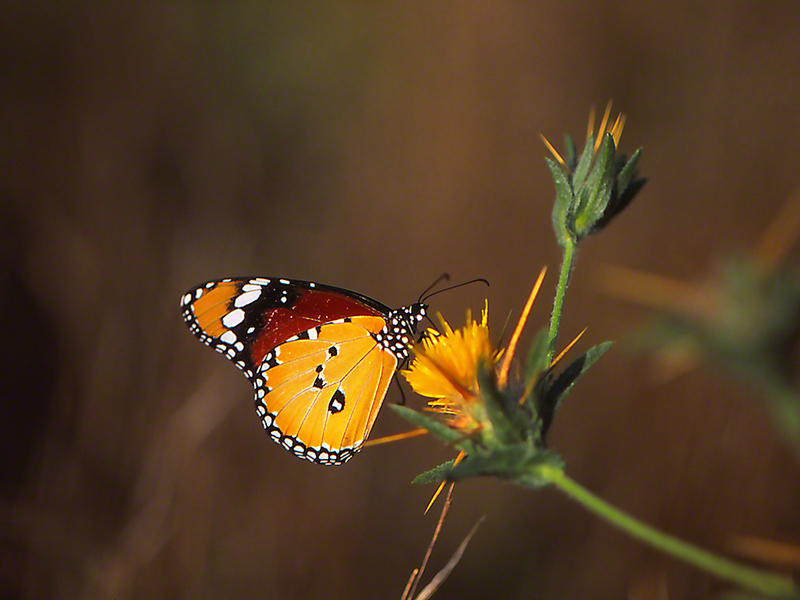 Both Danaus species sport the same colors. They are both categorized as milkweed (Asclepias spp.) butterflies. I don’t know the Israeli Asclepias species . . . ? Both have that same elegant flight, which can be flow and graceful, or as when the flee from Jeffrey, swift, stunningly swift. The Plain tiger butterfly is a beaut, this one front lighted, the Middle Eastern sun highlighting its eye-popping wing coloration. The menacing thorns on this plant typify the needle-sharp thorns found on so many plants in this part of the world. Caution is the watchword when working the wilderness in that part of the world. Hm, isn’t that so true.